Laurie’s mom loved Disneyland. This a very touching tribute to her mother. Hope you all enjoy it as much as I did. Thanks for sharing your memories with us Laurie! 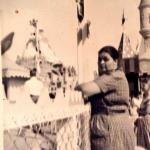 Mom was born September 22, 1925, in Hynes, CA. Late in life I figured out that she was high functioning autistic, probably, as no tests were ever done. All the signs were there that something was wrong with a teenager who had an IQ of 79 and bottom in English. I also have gone through the system that did nothing but seat me with boys and put me in remedial reading class when I was 3 grades ahead of my age. Mom was giving, kind, loving, generous, and a comforter. I look back at our trips to Disneyland and see now, things I did not know, but now understand. On September 23rd, I went to the Magic Kingdom at Walt Disney World to celebrate her birthday. I headed right for Casey’s for a gluten free hot dog and chips then onward to the popcorn stand in Liberty Square for popcorn and a bottle of diet Coke. I found a rare shady spot along the parade route in Frontierland and started on the hot dog. I was like a little kid with disintegrating bun, pickle relish, mustard, and onions everywhere. Gluten free buns can fall to pieces easily. I remember, sort of, times like that when I was a kid and spilled things on me. I tossed the trash and went for a bottle of water then started on our ritual, of sorts. 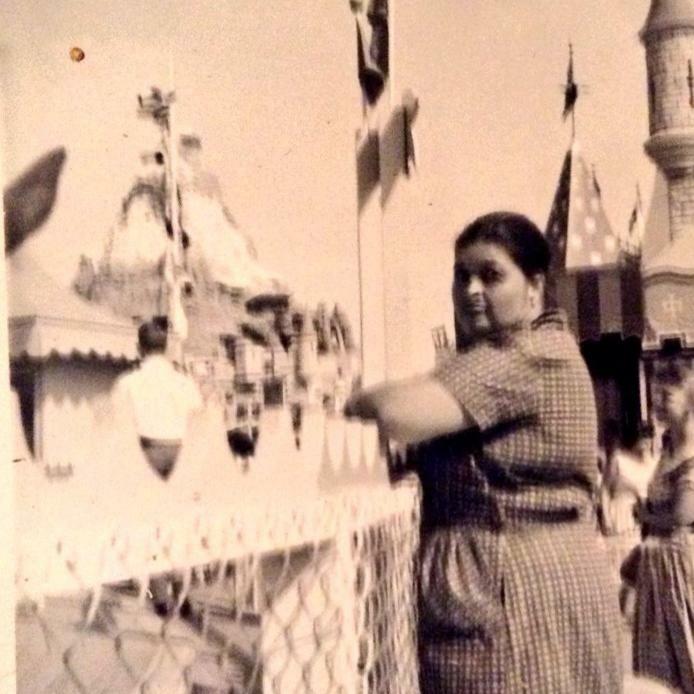 My mother could not handle stress but she loved Disneyland so much. The flowers and music as well as sitting on a bench with a diet Coke and popcorn as she watched people pass by. Sometimes she would encounter a stranger and enter an engaging conversation which she would later tell me. Around age 78, she went to the hospital with double pneumonia and out of control diabetes. She, her cousin Alicia, and her sister Mary, eventually died of complications of diabetes. Mom’s brother, sister, and half sister had diabetes as did her cousins. She came home and could barely walk and ended up at the end, in the wheelchair. I eventually lied to her and told her that at last minute we had to take a paid for trip. Once she was out of the house, she loved these local trips. My celebration focused on that part of her life, the last and best part. She would sit in her wheelchair with me on the ground beside her as we shared popcorn and Diet Coke. During parades, she would sit there tapping her black brogue to the beat of the music. Oh, how she loved music. I would take her on the Jungle Cruise at Disneyland and Small World which she rode every trip. I watched the parade at Magic Kingdom with her in my heart then hit Jungle Cruise and Pirates of the Caribbean. There was a soft opening two days before the March 18, 1967 official opening. Mom, Dad, Dad’s brother Bill, and I had just eaten a big meal when a cast member asked us if we wanted to try a new ride. We went on it and had fun but some were a bit more scared, lol. I received a free Halloween event ticket so I was in line for that when the rain drenched me. It was not a normal rain but one that kept going for hours and at 9 pm was still drizzling. I changed out of my top into a zip up jacket. I waited for the rain to ease up, if you can say that, and went to City Hall where they gave me a new date for the event. I was soaking wet when I arrived at the Polynesian Resort. I bought a towel and hit the bathroom for a new change of shorts and shirt. I put my other jacket on and tossed the towel on my lap. Could Mom’s celebration memorial end so bad? I was given 90 minute wait time for Kona Cafe so I found a barstool at Tambu Lounge while my scooter was charging. The chef gave me a gluten free roll and beef satay on three skewers. I took the sweet fruity slaw and beef satay together on top of the roll for the most awesome sliders one could imagine. I took my iced tea to a seat and waited happily. Kona Cafe finally paged me and boy were they on fire with the food that night. I started with the mushroom soup which reminds me of Mom, she loved canned soup as well as my clam chowder. Next was a dish that was just like ones Mom used to make with steak, mashed potatoes, and onions. OH MY WORD, BLISS!! I was taken back to days as a kid when I would eat and eat and eat taters and steak. She was not a good cook and rarely made anything fresh beside salads and meat, but oh the happy memories. This dish has a clove of garlic and roasted potatoes. Mom loved steak and potatoes au gratin at Steakhouse 55 in the Disneyland Hotel. That was probably the last meal out she ate. She would tap the table so that the coffee cup was on the left side. She would eat bread and butter, steak, potatoes, and share dessert with me. So the night ended with a bang and a fitting tribute to Mom at Kona Cafe. Thank you for sharing my memorial celebration of Mom’s birthday. She taught me manners, respect, love of nature, love of animals, love of food, and most important appreciation of the good things in life. She loved plush animals, country music, cartoons, Disney, movies, theater, art, and life. She did bad things but in the end she taught me well. I cannot hurt an animal because of her and I have given to others in need.